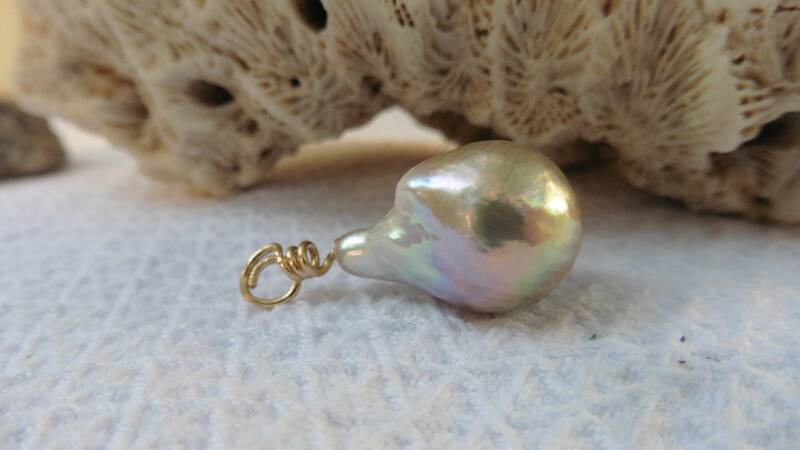 A pearl pendant from a single very large baroque pearl, 14 x 20 mm, which can easily be carried floating on a wire chain. Also with a tender golden chain this pendant looks adorable. It is a real Ming or Edison pearl. With the order you receive exactly this pearl. It was specially drilled as a pendant only from above. The loop is turned from stable goldfilled wire. A goldfilled wire is largely abrasion-resistant. The gold layer is approx. 100 times thicker with goldfill than with simple gilding. The gold layer is mechanically bonded to the base material brass. With simple gold plating, on the other hand, this is done electrolytically and can be rubbed off over time. This high-quality material "goldfilled" has the appearance of 18 carat gold. The Edison pearls are an original type of pearl with a core, developed from a new mussel cultivation, with a very special shine and a surface with depth effect, it looks a little bit like folded, natural round with a metallic surface. This pendant is initially supplied without a chain. You can choose between 4 variants: without suspension, with gold-coloured jewellery wire, with silk ribbon or with a very fine genuine 750 gold Omega hoop with a diameter of 1.2 mm and a length of 40 cm, which is covered on one side with yellow gold and on the other side with white gold. This necklace is very delicate and very valuable. It is thoroughly checked for intactness before shipping and cannot be returned in any case. On the photos above the pearl on the silk ribbon, the jewellery wire and the omega ring are examples and do not correspond to the pearl I sell here.